What I love about Kooser’s quote is the concept of discovery. Whose discovery? Is it that of the poet, recording the details in a manner to delight or is that of the reader, discovering the poem and becoming delighted? Let’s assume it is both. Natalie Goldberg suggests that young writers plant themselves in public and generate poems upon demand. This requires a certain poetic confidence that I don’t possess. Hence my admiration for Billy Marie at Typewriter Poetry where she churns out turns of phrase on her retro machine on sidewalks and at festivals. One early morning at the market, I had my own poetic discovery; typewriter planted firmly in his lap and a small sign requesting donations. As you can see from this link, Zach is another well known street poet. He sets up his chair on a street or at a market and, there, he has The Poem Store. 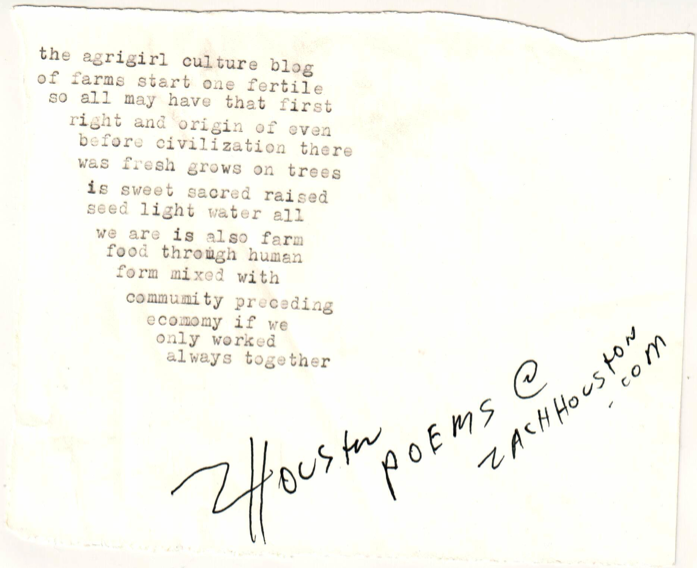 I was fortunate to run into him and as you can see above, he caught the spirit of Agrigirl – food and community and built it into poetry. With or without a street poet, the Farmers’ Market becomes a laboratory of the humanities. According to the internationally known environmental psychologist, Robert Sommer, people who shop at farmers markets have four-and-a-half times more social interactions per visit than they would have per visit to a grocery store. Other evidence from John Cacioppo, a neuroscientist at the University of Chicago and coauthor of Loneliness: Human Nature and the Need for Social Connection shares that individuals with more social interactions are healthier. Dare we connect them? Recall that during a heat wave, individuals with more social interactions, contrived mainly because of the proximity to small merchants, had a stronger chance of survival. In fact, Cacioppo tells us that we should all play with the idea of trying to get small doses of good social interactions daily. Just calling out to someone, “Isn’t it a beautiful day?” or “I loved that poem!” can bring a friendly response that makes us feel better and consequently, healthier. With whom we share a selfsame thought or tone. In each flat step, in every common phrase. To dwell within in satisfied repose. Ringing, remembered — none but both can tell. It’s National Poetry Month. Celebrate Poetry. Fabulous! Love poetry! Love Farmer’s Markets! Love your blog! And here it all comes together – most excellent! Thank you Diane. I love the notion of infusing poetry into unexpected places. Where else would it be fun to see a poet? Wonderful ideas just leaping off the page! This arrived at a perfect moment. (How DID you know?!) More on that later. I think poetry goes with your beautiful art perfectly. Can’t wait to see what you are thinking. It’s true that shopping at a farmers market involves far more interaction and connection than shopping at a supermarket. I hadn’t really thought about it before, but I do enjoy that aspect of the experience. I think we all long for connection, particularly with like-minded people. Thank you for sharing this poetry as well. There’s a lot to be said about social interactions Melissa. Apparently we have an average of 17 of them daily. I don’t know what a healthy range is but I’m sure going to make sure that my 17 are quality. Tammy, what a fabulous post! I love the poems and the idea of bringing it into the market where so much beauty is shared. Thanks for this lovely morning read. It’s a perfect venue for a poet, isn’t it? A little Wendell Berry next to the dinosaur kale? Me too Nancy. Talk about poetic confidence! The fact that this talented person just typed that out amazes me. Lovely poetry. And I am captivated by the idea of going out onto the pavements with a typewriter to write instatnt poetry. What an enchanting idea. Don’t you love it? I’m so happy that there is a use for those lovely old machines. Good point Charlie. Yes, solitary confinement is a method of punishment. How cool! I wish I had a farmers market poet. And, yes, social connectedness is a key component to human wellbeing, and farmers markets are great places to connect with your neighbors as well as the farmers who grow your food. It sounds as if you have a wonderful farmer’s market. We do have a fabulous market. Alas, it does not have a poet. This was at a market that I visited while traveling. Great idea though, isn’t it? Tammy . .thank you! You always teach me and inform me. I didn’t know about poets setting up shop in farmer’s markets. Wonderful! That photo at the top was poetry to me. You could do it Deb. Plop down in a public place somewhere with an old selectra? The poem that he did for me is really a treasure. There is a new coffee shop in town that has these old typewriters at every table. It’s funny isn’t it: so much of what now passes for news or politics or wisdom in our culture is emoted rather than logically conveyed. Our society is filled with feelings rather than facts, and facts that we fear so much we cannot face them. In such an emotion-driven environment poetry should naturally be a literary pandemic, on everyone’s lips and impossible to avoid, and yet even now we struggle to understand it. I wonder if it is our assumptions regarding stanzas and sentence structure that would have us believe that only certain groups of words are poetry, and only certain authors are poets – when in fact the world is filled with poetry, it surrounds us every day, even now. All words are poetry if we choose to interpret them that way. In fact, a lot of news and politics and cultural wisdom suddenly make much more sense when interpreted as the fictional product of a tortured artist. Agreed Rob. All words are poetry. In fact, I think a lot of the cutting edge music that my kids are listening to really takes a lot of the news and politics and puts it to verse. my father getting out of a car. His hand shuts the door without looking back. His gait walks across the street in traffic. Very nice – mine is coming to visit this week. Lovely story today, thank you for a nice Sunday morning read with my tea. Sewage bubbles to the surface. Hahahaha! That is so funny. Did you see the chicken poetry that has been going around? Lori, I would love to see you do something like this. We need to bring more acknowledgement to poetry and what a better way? I love the interaction at the farmers market. It is the best part about it. To meet the people who grow your food is important and here in Boulder Colorado most of the growers actually come to the farmers market to sell thier produce instead of hire people to sell for them. It is also all local produce and not anything bought and re-sold. I love Boulder! Boulder is terrific. I miss it a lot but visit several times per year. Farmers Markets are such hard work. waw! Street poems! How cool is that! This street poet really caught it right about your blog! You woon’t see anyhtning like this here in belgium! Waw, even! Thanks Sophie. Maybe you can start the trend in Belgium! I don’t think any of our local farmer’s markets have street poets–what a fun innovation! Sounds like a job for you and your kids Inger! Inspiring poetry that excites the mind and heart. 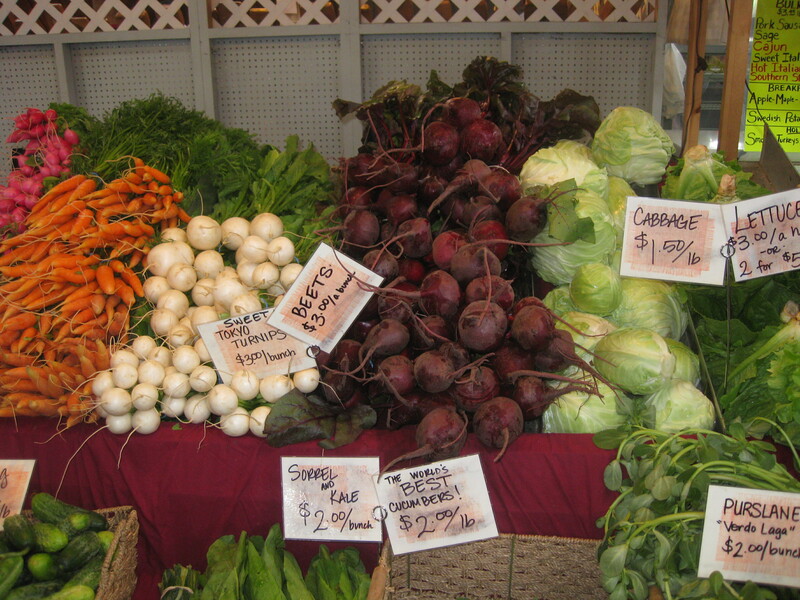 As for Farmer’s market, just love everything about it. Colorful, exciting, lots of healthy stuff to discover and indulge in. And the market comes even more alive with it’s own poet! The most special of friendships, I think. I agree on all three accounts. I love the idea of encouraging poets to do this public work. I’m glad you got the experience of public poetry…it is happening slowly but surely on a global scale. My personal hope is that it will change human interaction bit by bit, encouraging creativity, connection, and personal worth.